For the past few months spending time on my Macbook Pro I have been using Timing App 2 for tracking my time spent. I feel that it’s the perfect time to review this cool little app after using the trial. There are a lot of time tracking tools for Windows, but for Mac, they don’t have that many. Maybe because Mac users are more comfortable spending on cloud apps instead of desktop app. However, I don’t use the Mac frequently, only when I’m on coffee shops or when traveling, so could apps with subscription payment? So not a good deal for me. Timing App is a desktop time tracking tool for Mac. It’s not like other cloud apps where you have to login and connected to the Internet in order to use it. 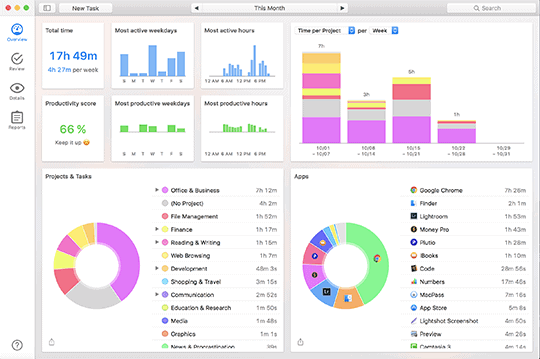 Timing App just sits on your desktop and collects data inside of your Mac. I’ve seen other web apps like Rescue Time but having a hard time to purchase since they only use a credit card instead of paypal for the payment processor. Other things is it’s not customizable for the project and tasks I was working on. Furthermore, I don’t like the subscription payment for something that doesn’t update very often. It’s like wasting money down the drain. Cloud apps are usually great if you can use it on multiple devices so it can be done on the go. However, that’s not the case with a time tracking tools. I’ve tried RescueTime tracking on android devices, and it tells me that I’m on Facebook 100%, which is definitely not. I turned off the notifications and all, but the app just keeps telling me to close Facebook. It’s already closed. This is where desktop apps will still have its place on the cloud world. Getting a portion of web app world, Timing App is a great application to track your schedule. It comes with single payment so you don’t have to worry for multiple payments. Upgrade will be on discounted. It’s a great deal since OS doesn’t change that much over the years. What I really like about Timing App is the ability to track time based on your project. However, in order to get the feature, you need to purchase the $49 version instead of the $29 one. It’s one feature that won me. Other time tracking apps don’t have them so you can easily know which tasks are making the most value and what tasks are wasting time based on the graph and diagrams on the report. There are a lot of time management apps you can use. I think this app is going head to head with RescueTime, which has larger customer base. However, it has unique feature, which is one-time payment and has manual time tracking which RescueTime doesn’t have, but you really have to shell out $49 to get it. For a year, it would cost $4/month, which is quite cheap for the feature it has.